Our experience with traditional laces has been far from perfect. They are either too tight or too loose, always come untied, and look messy. The HICKIES Lacing System is a no-tie shoelace alternative designed to adapt to your life and how you move. Our modular design and smart material allow you to target how your shoe fits along different parts of your foot, providing personalized comfort and flexibility with each step. Whether running, traveling, training, or on your feet all day, your shoes will fit like a glove and look better, too. Once you install HICKIES laces, you'll never have to tie or untie your shoes again. Slip shoes on to run errands, walk the dog, or switch between pairs with ease. 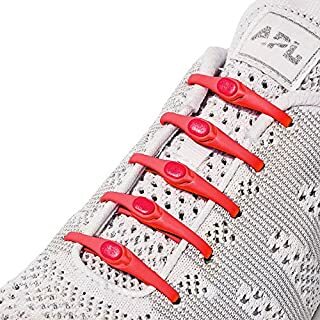 Bright, easy, and customizable, the HICKIES Lacing System is a universal product fit for everyone. 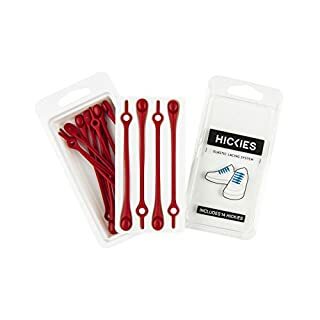 HICKIES Kids is a one size fits all no-tie shoelace replacement designed for kids aged 5 to 12 that transforms any shoe into a slip on. 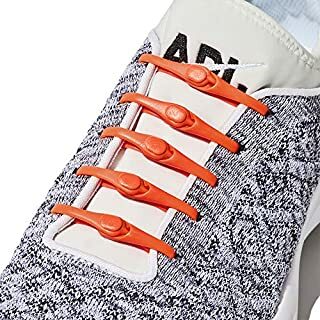 HICKIES Kids Elastic Shoelaces work by threading seamlessly through the eyelets of any shoe, then snapping securely in place for a hassle-free fit. Fasten HICKIES Kids Elastic Shoelaces once and forget about loose laces. Our lacing techniques are a perfect way to make sure sneakers fit the way you want them to. Each pack of HICKIES Kids comes with 10 pieces, enough for a standard pair of kids trainers. This bundle contains 1x Black and 1x White HICKIES packs. Our experience with traditional laces has been far from perfect. They are either too tight or too loose, always come untied, and look messy. The HICKIES Lacing System is a no-tie shoelace alternative designed to adapt to your life and how you move. Our modular design and smart material allow you to target how your shoe fits along different parts of your foot, providing personalized comfort and flexibility with each step. Whether running, traveling, training, or on your feet all day, your shoes will fit like a glove and look better, too. Once you install HICKIES laces, you'll never have to tie or untie your shoes again. Slip shoes on to run errands, walk the dog, or switch between pairs with ease. 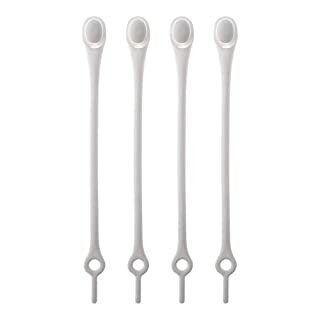 Bright, easy, and customizable, the HICKIES Lacing System is a universal product fit for everyone. Are you tired of always tying your shoes up? 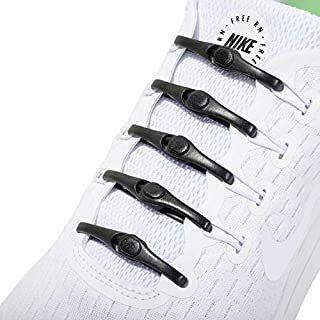 Then make a simple switch to these awesome White Hickies Laces, elasticated rubber shoe laces that are a revolutionary new way to fasten your footwear, turning them into stress free slip ons! Hickies are adjustable in length and make a good replacement for traditional laces you tie up. 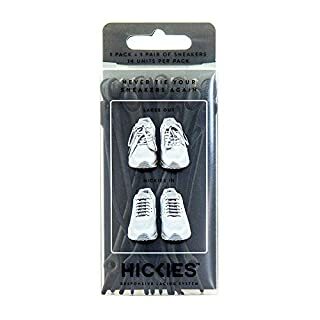 Each pack of Hickies Laces contains 14 Hickies, enough for every average pair of shoes, and come in a fantastic range of colours that are not only practical but add plenty of style. A great part of the fun of Hickies is being able to customise your look with their wide range of designs. So try them for yourself and you'll instantly feel the difference of having footwear you can easily slip on! Are you tired of always tying your shoes up? 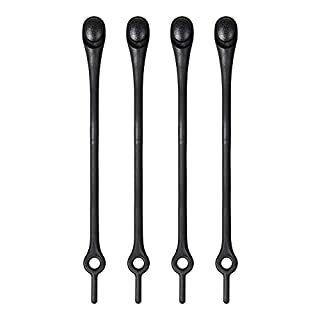 Then make a simple switch to these awesome Black Hickies Laces, elasticated rubber shoe laces that are a revolutionary new way to fasten your footwear, turning them into stress free slip ons! Hickies are adjustable in length and make a good replacement for traditional laces you tie up. Each pack of Hickies Laces contains 14 Hickies, enough for every average pair of shoes, and come in a fantastic range of colours that are not only practical but add plenty of style. A great part of the fun of Hickies is being able to customise your look with their wide range of designs. So try them for yourself and you'll instantly feel the difference of having footwear you can easily slip on! Our experience with traditional laces are very frustrating. Laced they are either too tight or too far, you go on and you will be able to see when pulled often Schlampig. 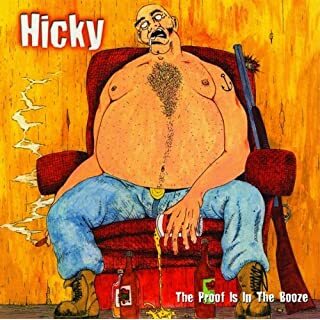 The Hickies lacing system only requires to be adjusted once and contours to your individual requirements and habits. Our modular system, and the reactive material make it possible for you to adjust the fit of the shoe to meet the different needs of your feet and provide optimum comfort and a secure grip. Whether you're Joggst, vereist, trainierst or simply the whole day carrying around: your shoes Sizten like a glove and they look good. Once adjusted, you have to you never again have to the shoes. Slip and you're ready errands, walk with the dog dog, or next create extra to change. 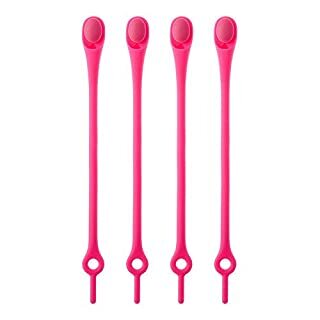 Bright, simple and flexible feel good, the Hickies lacing system is multi-talented which will suit all. 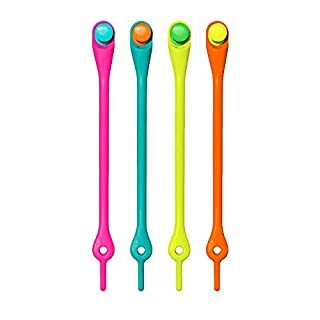 A clever and practical substitute for shoe laces, stretches to fit. Product Features USB Cooling Fan Table Heated Laptop Open Cooling Smooth curved edges Variable angle adjustment You can adjust the height. 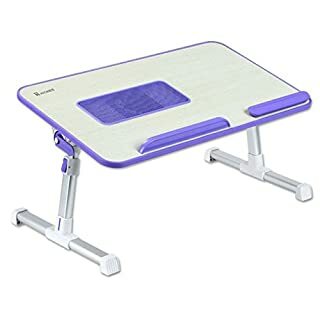 Portable Table with Foldable Design It is designed to withstand heavy loads up to 40kg.